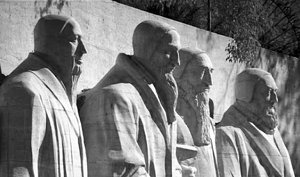 The Reformers modeled public courage. Luther famously refused to recant his writings before the Diet of Worms in 1521, stating at the risk of his life, “I am bound by the Scriptures I have quoted, and my conscience is captive to the Word of God.” Though Luther managed to avoid martyrdom, others bravely defended Protestant doctrine to their death. The martyrs included men and women, pastors and laypeople, old and young who believed standing for Christ was more important than life. The Reformers recovered expository preaching. In 1519, Zwingli broke from the standard practice of preaching according to the church calendar and launched a six-year series of expository sermons through the entire New Testament. Calvin likewise preached through books of the Bible, covering most them over the course of his ministry. So committed to sequential exposition was Calvin that following a three-year exile from Geneva, he resumed preaching in 1541 from the exact point in the Psalms at which he left off. The list could continue of ways the Reformers applied their doctrine to everyday life. The underlying point is that Reformation doctrine cannot be partitioned off as affecting only a narrow slice of existence. Luther and company recognized biblical truth has far-reaching implications—a vision the church desperately needs to embrace five centuries later.